Abstract. As the most recent warm period in Earth's history with a sea-level stand higher than present, the Last Interglacial (LIG, ∼ 130 to 115kyrBP) is often considered a prime example to study the impact of a warmer climate on the two polar ice sheets remaining today. Here we simulate the Last Interglacial climate, ice sheet, and sea-level evolution with the Earth system model of intermediate complexity LOVECLIM v.1.3, which includes dynamic and fully coupled components representing the atmosphere, the ocean and sea ice, the terrestrial biosphere, and the Greenland and Antarctic ice sheets. In this setup, sea-level evolution and climate–ice sheet interactions are modelled in a consistent framework. 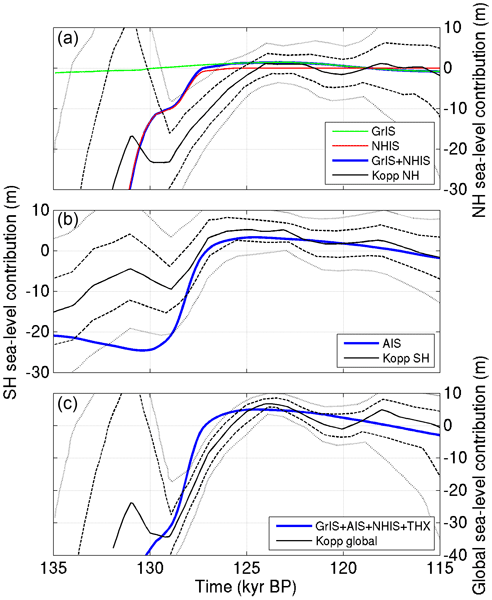 Surface mass balance change governed by changes in surface meltwater runoff is the dominant forcing for the Greenland ice sheet, which shows a peak sea-level contribution of 1.4m at 123kyrBP in the reference experiment. Our results indicate that ice sheet–climate feedbacks play an important role to amplify climate and sea-level changes in the Northern Hemisphere. The sensitivity of the Greenland ice sheet to surface temperature changes considerably increases when interactive albedo changes are considered. Southern Hemisphere polar and sub-polar ocean warming is limited throughout the Last Interglacial, and surface and sub-shelf melting exerts only a minor control on the Antarctic sea-level contribution with a peak of 4.4m at 125kyrBP. Retreat of the Antarctic ice sheet at the onset of the LIG is mainly forced by rising sea level and to a lesser extent by reduced ice shelf viscosity as the surface temperature increases. Global sea level shows a peak of 5.3m at 124.5kyrBP, which includes a minor contribution of 0.35m from oceanic thermal expansion. 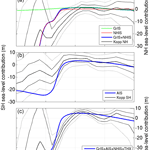 Neither the individual contributions nor the total modelled sea-level stand show fast multi-millennial timescale variations as indicated by some reconstructions. How to cite: Goelzer, H., Huybrechts, P., Loutre, M.-F., and Fichefet, T.: Last Interglacial climate and sea-level evolution from a coupled ice sheet–climate model, Clim. Past, 12, 2195-2213, https://doi.org/10.5194/cp-12-2195-2016, 2016. We simulate the climate, ice sheet, and sea-level evolution during the Last Interglacial (~ 130 to 115 kyr BP), the most recent warm period in Earth’s history. Our Earth system model includes components representing the atmosphere, the ocean and sea ice, the terrestrial biosphere, and the Greenland and Antarctic ice sheets. Our simulation is in good agreement with available data reconstructions and gives important insights into the dominant mechanisms that caused ice sheet changes in the past.